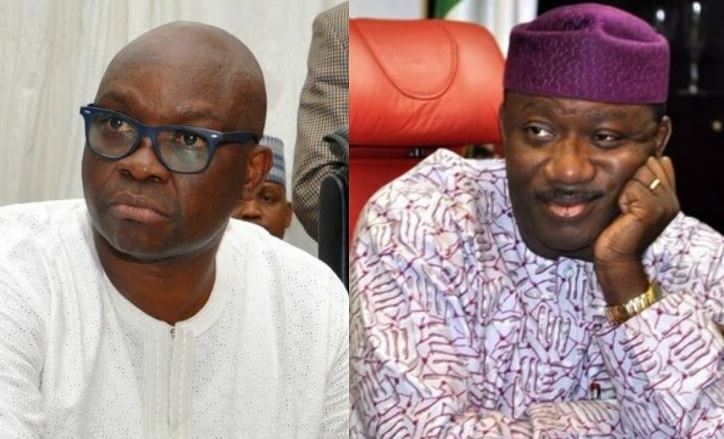 Fayemi described Fayose as a “pathological liar” for claiming that the debt he (Fayemi) left behind was responsible for his (Fayose’s) inability to pay workers’ salaries and pensioners benefits as and when due. Gud morning all nd happy sunday 2 u all. Ontop kini? For ur mind. na waoo I thought this man left two to three months workers salaries before he left office. that was when the economy of the country and States was still buoyant. is it now that he wants to be workers friend and saint? what about other APC states like his two neighboring Oyo and Osun state? are they also up-to-date in paying salaries even when they have power at the centre? do they not also collected the bailout and the Paris club fund?.what magic does he wants to perform now when he couldn’t do that magic during his tenure in office with the buoyant economy as at that time? the answer to our problems is God kingdom to take control. It’s only God that save us from these so called politicians. May God bless Nigeria with good leaders. AMEN. Have a lovely week everyone. Make I sit down they watch them these armed robbers who want to become governors.